As of late, I have found myself getting more and more hungry in between meals. This is due to the increase in workouts that I have done over the last several weeks (something I will share soon) and getting hungry is just my bodies way of telling me to give it more fuel. The problem with the “snacks” sold at the store is the majority (if not all) have tons of preservatives and unneeded ingredients. They are filled with garbage to be frank. What about healthy homemade protein bars? I could choose the ingredients, the amount of protein, and the size that I want them. It’s perfect. 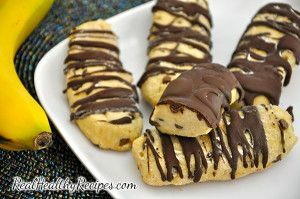 That said, I have scoured the Internet to find 4 amazing, healthy protein bar recipes that I will share with you today. Feel free to have these as snacks along with your fruit and veggies. It’s the perfect combo! In a medium bowl combine the protein powder, coconut flour and sea salt. 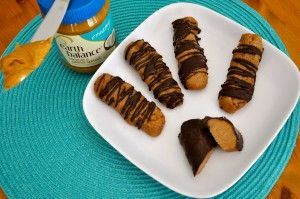 In another medium combine the peanut butter, coconut milk, vanilla and almond extracts. Mix until smooth. Add the dry ingredients and mix until fully combined. If the batter is dry then add a few drops of water. Line a freezer-safe plate with wax paper. Form the dough into 12 bars. Place on the wax paper and put in the freezer for 20 minutes. In a double boiler over medium-low heat (make your own by placing a small saucepan directly in a skillet that has few Tablespoons of water) melt the dark chocolate and coconut oil. Remove the bars from the freezer and drizzle or dip in the melted dark chocolate. Return to the freezer for 10 minutes until the chocolate has hardened. I suggest storing these bars in the freezer — Then simply allow to defrost slightly before enjoying! In a medium bowl combine the protein powder and coconut flour. In another medium bowl mash the bananas. Add the coconut milk, water and vanilla, mix until smooth. Add the dry ingredients and mix until fully combined. If the batter is dry then add a few more drops of water. Mix in the chocolate chips. Line a freezer-safe plate with wax paper. Form the dough into 10 bars. Place on the wax paper and put in the freezer for 20 minutes. Step 1: Select your protein powder and add your coconut flour to it. Step 2: Blend the powder and flour with coconut milk. If you want, you can also add nut butter. You want to add enough liquid, (and nut butter if you like), to make the batter come together like dough. The goal is to end up with a batter that you can form into bars with your hands. Step 3: Shape the above batter into bars. If, after mixing your ingredients, your batter is too moist or sticky to mold, add a tiny bit of coconut flour or protein powder until you get the desired consistency. You want to be able to shape the bars, so getting the batter dry enough is essential. If, after mixing your ingredients, the batter is too dry, add a bit of milk until you get the desired consistency. Don’t make it too liquid-y though, or you’ll have to go back to adding flour. Step 4: Melt some chocolate in a bain-marie or in a glass bowl on top of a pot of boiling water. Once it’s melted, dunk the bars in the chocolate or pour it over the bars. I like to coat my bars in 90-100% chocolate, but you can go as dark (or light) as you want. Obviously, the darker the chocolate, the less sugar and more antioxidant goodness it contains. Step 5: Place bars in the freezer for at least 30 minutes. They’re ready to pack up and take with you or you can eat them on the spot! 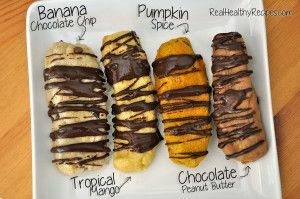 ==> For more great protein bars and recipes click here <—– 110 Fat Burning Nation Approved Fat Burning Meals! The next time you are in need of a healthy snack, don’t go reaching for the pre-packaged, preservative filled protein bars or snacks. Instead take 30 minutes, make a huge batch of one of the healthy protein bar options above and munch on that. => For more recipes, be sure to check out Family Friendly Fat Burning Recipes <—– Sale ends soon!